Please send me more information on ATV Tour! 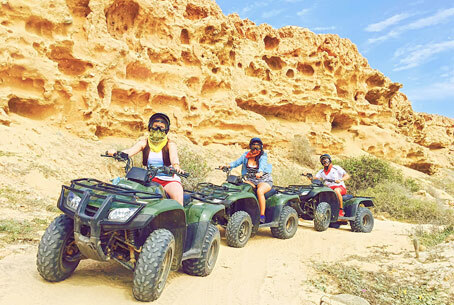 Explore spectacular oceanside cliffs, lush desert ranges and canyon trails at the wheel of a nimble, peppy 450 Honda all-terrain vehicle. For those looking for a challenging and exciting ATV ride (and one with one spectacular sight after another), look no further! Your 40-minute drive from the hotel will take you to Rancho Carisuva along the mighty Pacific Ocean. At this ranch you will receive an orientation on the proper operating techniques of your ATV, as well as free time to explore a typical Baja Californian ranch with horses, goats, a friendly donkey, chickens, a freshwater well and a traditionally built desert hut—all Baja California style. 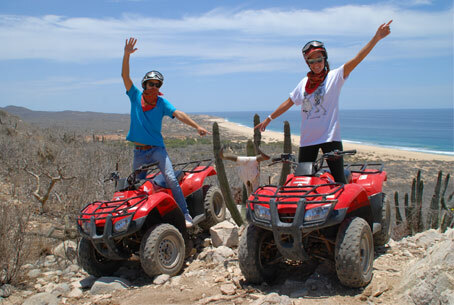 Hop on and follow your guide for a glimpse into Baja’s rugged terrain, where along your ride, you will see cactus over 20 ft high towering over the trail, wild animals, exotic desert flora and incredible views. Stops will be made along the way for informative presentations about the desert flora and fauna; you'll also have a stop at an appealing lookout point over the Pacific Ocean. Don’t forget your camera, as the sights on this tour are one of a kind. From January through March keep an eye out towards the ocean as the migrating whales pass along the shore—Carisuva ATV rides have it all! Participants wishing to drive must be at least 16 with parents' written consent, or 18 with drivers license. 4 hours approximately including round-trip transportation. One hour and 45 minutes plus free time at the ranch. Safety: All tours guided by our bilingual Eco-Guides and escorted by a certified paramedic. Medical attention and ambulance available in the vicinity if needed. Pregnant women or guests who suffer from back or neck injuries not recommended on this tour. Guests who are intoxicated will not be allowed on the tour. Closed shoes, long pants, sunblock and a light jacket. Don’t forget to bring some cash in case you wish to purchase something at the Carisuva Boutique!